Adults have smooth eyes, and strongly crenulated wing borders. 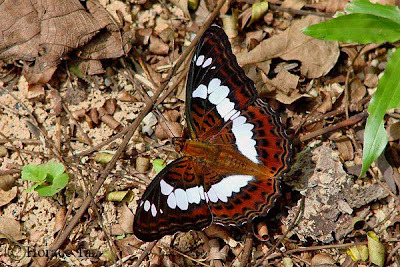 Above, the dark reddish brown wings are traversed by a broad white macular band, starting from a large white spot in the cell on the forewing to near the mid-dorsum on the hindwing. Four subapical white spots are found on the forewing. Each hindwing has two series of black submarginal and postdiscal spots, and features an open cell. 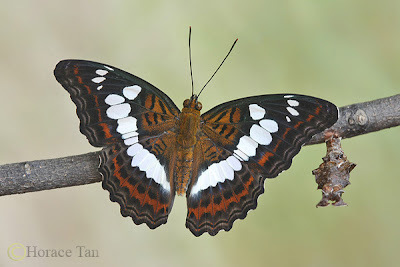 The underside is marked as above, but the basal halves of the wings are pale greenish grey in contrast to the orangy brown on the upperside. Locally the sightings of the Commander are restricted to the various local nature reserves where it is not uncommon to find them flying along forest trails, in the neighborhood of streams, or puddling on the ground. Females can occasionally be spotted making oviposition visits to the various species of host plants. The adults are usually found singly, and they fly with a strong and determined flight. 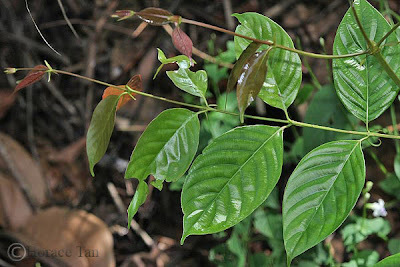 The first known detailed record of the early stages of the Commander was given by Morrell, R. in his 1948 article in the Malayan Nature Journal, based on his observations made while he was in Singapore. 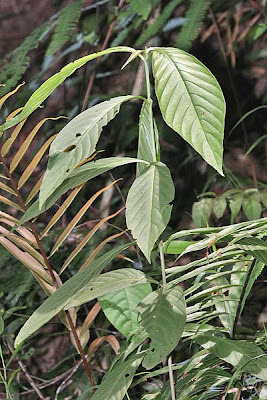 Host plants reported by him included Timonius wallichiana (Common name: Silver Timon) and various species of Uncaria. This is still the case today in our nature reserves where Silver Timon and up to four Uncaria spp. (yet to be properly identified) have been found to be utilized by early stages of the Commander. This current account of life history is based on two caterpillars reared from eggs on one Uncaria sp. (see picture on host plant #2). Host plant #2: an Uncaria sp. 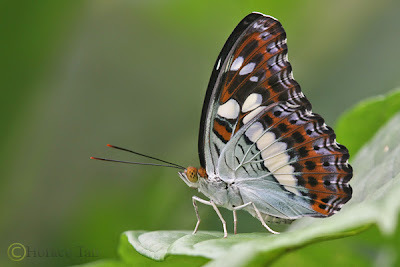 Typically, the mother butterfly lays eggs singly at the leaf tip of the host plant, but on occasions where there are torn or eaten leaf edges, eggs could be laid at the false tip by the "misled" mom. Characteristic of the species in the Limentidini tribe, the eggs are somewhat globular in shape, with surface marked with hexagonal pits and bearing short spines at pit corners, giving them the appearance of minute sea-urchins. Each egg has a diameter of about 1mm, and about 1.1mm in height. 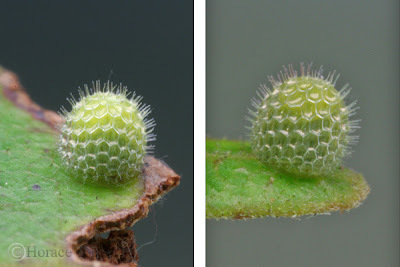 Eggs of the Commander laid at leaf edge (left), and leaf tip (right). The egg takes 3.5 days to hatch. The young caterpillar eats its way and proceeds to finish up the rest of the egg shell. The newly hatched is about 3mm long and has a cylindrical dark greenish brown body covered with many small tubercles. The head capsule is orange in base color and speckled with dark brown patches. 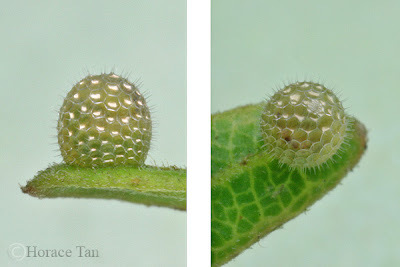 Normally, as the egg is laid at the leaf tip, the newly hatched will start feeding from the tip down the midrib of the leaf and eat its way symmetrically on both sides of the midrib, which is left projecting. At the tip of this exposed midrib, the caterpillar builds a frass chain (frass pellets strung together with silk threads). If hatched from an egg laid at a damaged edge, the newly hatched will simply start feeding from that edge, and builds its frass chain there as well. 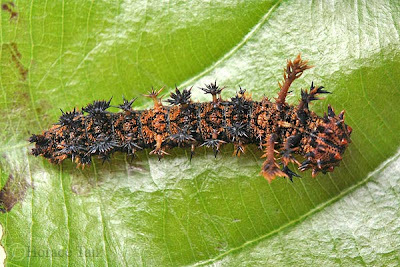 In addition to the frass chain at the tip of the midrib, the young caterpillar also constructs two rolls, one above and one below the surface of the leaf and at right angles to the the midrib, consisting of its own excrement, bits of leaf lamina and silk. The caterpillar usually rests at the exposed midrib near these two rolls. As the caterpillar grows in length and size, it also grows the rolls in tandem. 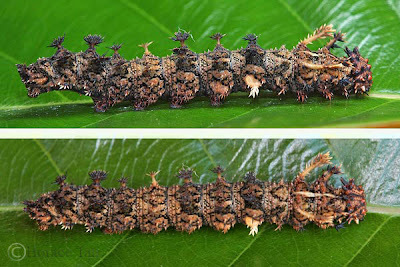 The rolls have approximately the same length, thickness, colour and apparent texture as the caterpillar itself, making them two unpalatable dummies to discourage any prey. The caterpillar uses its head to push back the rolls as more and more of the leaf lamina is consumed. This system of feeding and building decoys will continue all the way to the penultimate instars. 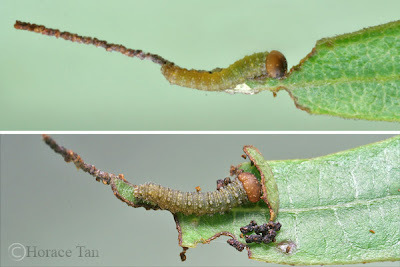 After 3 days in the first instar and growing to a length of 6-6.5mm, the caterpillar moults to the next star. 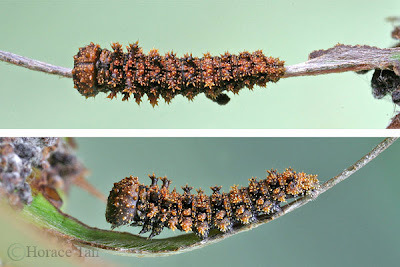 The 2nd instar caterpillar is brown with darker markings, and the body segments are armed with spiny and tasselled tubercles, of which those on the 2nd and 3rd thoracic segments are the longest. The dark bown head is armed with short and blunt spines. 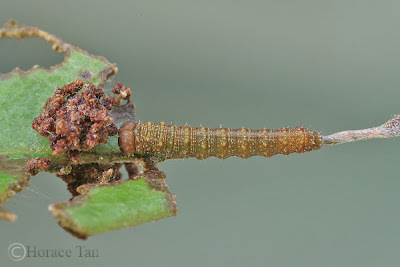 This instar lasts 3 days with the body length reaching 10mm. 2nd instar caterpillar resting against its decoy. 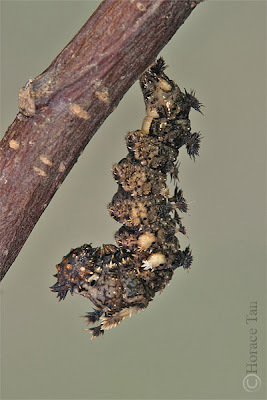 Compared to the earlier instar, the 3rd instar caterpillar has proportionally longer and prominently branched spines. 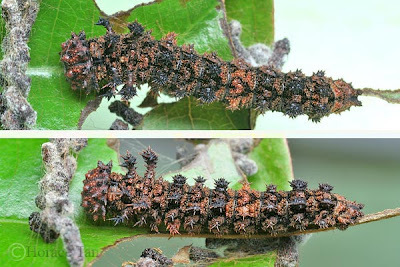 The overall appearance of the caterpillar resembles a collection of its frass pellets in shades of brown and black, just like the two decoy dummies it builds in its proximity. Through all instars, as Morrell first described it, the caterpillar appears to be just "a mass of earthy particles held loosely together, and it moves by tumbling and shunting in a slightly shaky way with sudden stops and jerks". 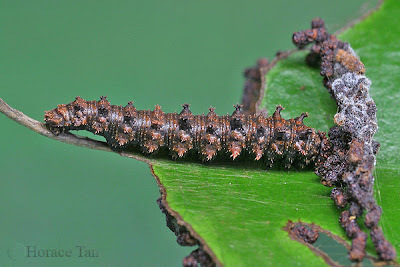 The 3rd instar lasts 3 days with the caterpillar reaching a length of 15-16mm. 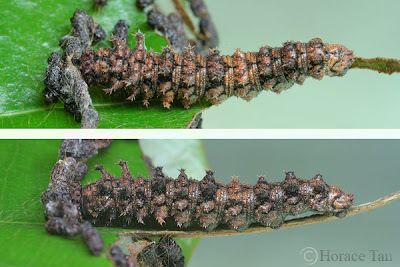 The 4th instar caterpillar again has a similar appearance as in the previous instar except for the much longer and larger spines, particularly the two pairs on the 2nd and 3rd thoracic segments. This instar lasts 4 days with the length reaching 23-24mm prior to the next moult. 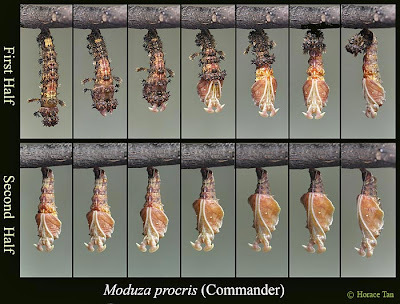 The next moult brings the caterpillar to its 5th and final instar. The extraordinarily branched and tessalled dorso-lateral spines are now much more projected and prominent on all body segments, the one on the 3rd thoracic semgnet being the longest. The head capsule is pale brown in base colour with black markings, and dotted with numerous dark pits. Fringed with black short spines, the head also has eight short and round orangy brown tubercles. All in, a head has a very fearsome appearance. 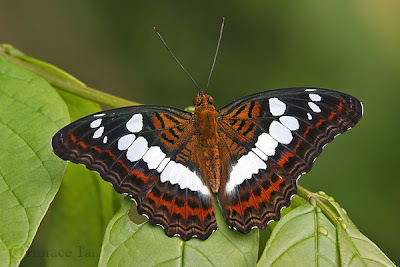 When disturbed, the caterpillar adopts a characteristic kung-fu posture with the black quarters raised, anterior body arched and the head tucked beneath the thorax. 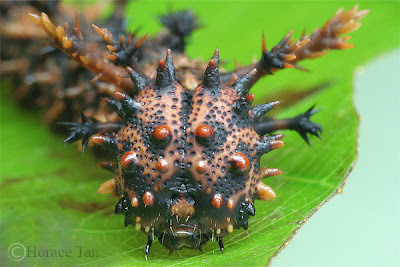 The head of a 5th instar Commander caterpillar. The 5th instar caterpillar does not bother with the decoy construction process, and in the wild it will roam freely over the host plant. 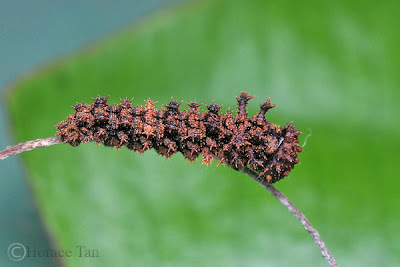 This instar lasts for 5-6 days, and the body length reaches up to 40mm. On the last day, the caterpillar ceases feeding and its body gradually shrinks. It wanders around the plant in seach of a pupation site. Eventually it settles down on a stem or branch where it spins a silk pad from which it hangs vertically to take on the pre-pupatory pose. Pupation takes place a day later. 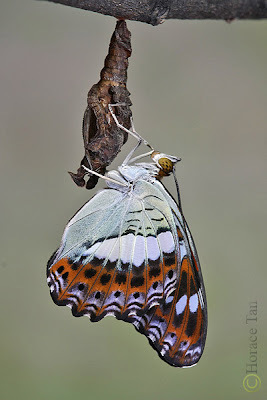 The pupa suspends itself from the silk pad with no supporting silk girdle. When disturbed, the abdominal segments flex laterally, and could stay in that position for a period of time. It is almost entirely brown in color with segments and parts outlined in dark brown to black. The pupa has a pair of curved and broad cephalic horns. 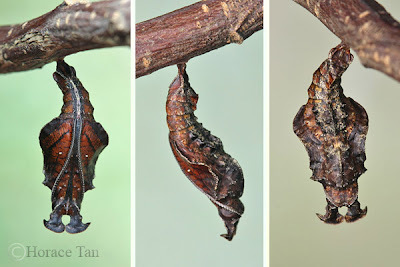 Overall, the pupa has the appearance of a "tightly rolled withered leaf" as Morrell described it. 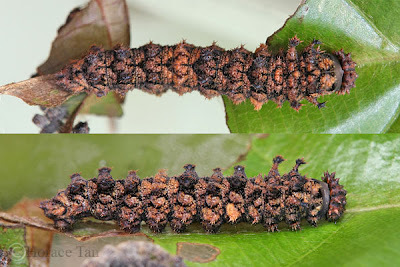 Length of pupae: 18-19mm. 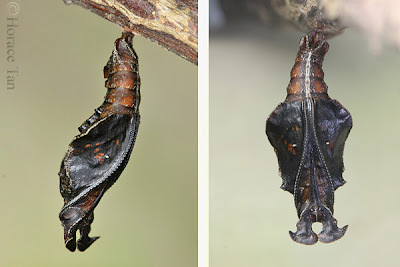 Two views of a mature pupa of the Commander. After 7 days of development, the pupa turns black in the wing pad area as the development within the pupal case comes to an end. The following day, soon after day break, the adult butterfly emerges from the pupal case. Notes on the larvae of some common Malayan butterflies, Morrell, R., Malayan Nature Journal, vol.3, no.2, 1948, pages 1-6.